Normally, we're interested in cover art within our music player. But it's also useful for file and folder navigation. For this, we need folder cover art, which is cover art shown for each folder in Windows Explorer. Windows makes this quite easy, but the exact manner in which art must be stored depends on which version of Windows you have. If you have Windows XP, you need to store each cover art image in a file called 'folder.jpg' (case insensitive). This way, Windows Explorer will pick up the image and use it as the folder cover art file. In Windows 7 it's even easier. 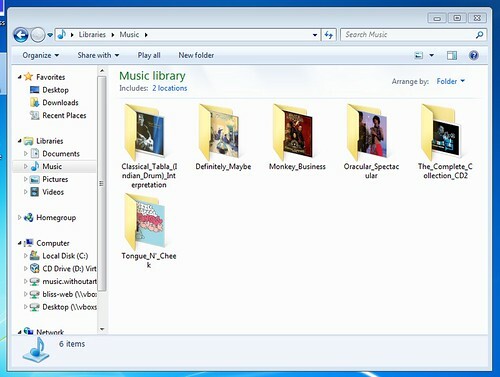 Windows 7 is capable of showing art embedded within music files. So, you need to just follow the normal advice of embedding album art. However: there's a caveat. Windows only recognizes certain types of music file. If you use FLACs for instance, as I would recommend, Windows will not be able to 'see' the embedded art, so you must use a separate file, similar to Windows XP. It's easiest to just save a separate image file anyway, for enhanced compatibility with other music players. You can use bliss to ensure all your album art is setup to be viewed in Windows Explorer, whether Windows XP or Windows 7. The first step is to set the co-located cover art filename to 'folder'. Embedding art is optional, but I always recommend it and within Windows 7 there's better support for showing embedded art, so it's worth enabling. This is a flexible way of storing your cover art. I hope this helps you make your music collection more navigable too!